Nantucket 04A - Spring availability – won’t last long! Features: Beach Chair & Umbrella (Seasonal – Fee) / Bike Rentals (Seasonal – Fee) / DVD Rentals – Free / Wi-Fi – Fee. Nantucket Rainbow Cottages 4A is professionally managed by ResortQuest by Wyndham Vacation Rentals. Enjoy this wonderful warm contemporary unit with a peak of the Gulf waters from a private 2nd floor balcony. The master bedroom has cozy queen bed with upscale bedding and a flat screen TV and DVD player. The kids are sure to love the fun bunk beds with bold nautical striped bedding. The bathroom offers a glass enclosed shower with a single vanity. The living room is nicely decorated with earth tones and nautical touches and features a sofa sleeper, two occasion chairs, a dining table for four, a TV, a DVD player, and access to the balcony with beautiful Gulf water view. There is also a CD stereo system for your listening pleasure. Upgrades include a full size refrigerator and stove. There is a centrally located coin operated laundry room also for your convenience right by the pool. 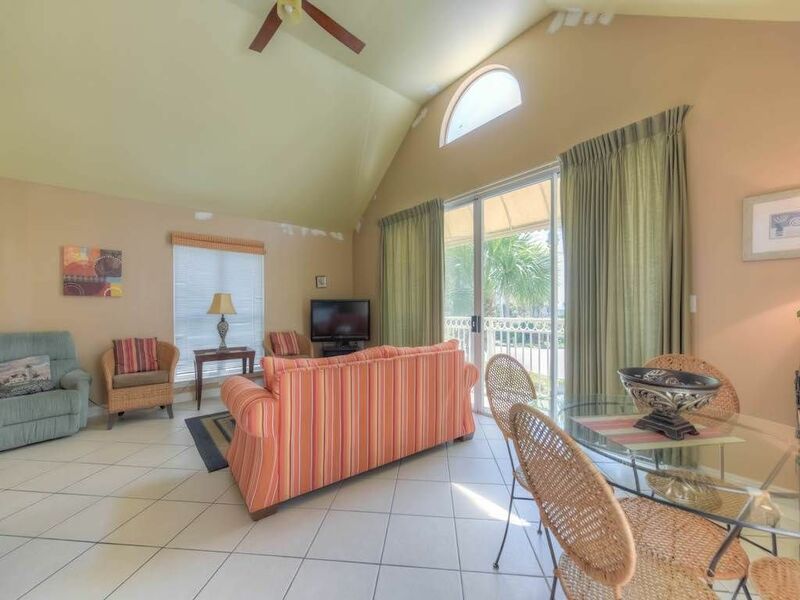 Come and make this wonderful beach unit your next vacation by the beach! A beautiful beach front property. Loved my stay , what a cute place and very convenient to shopping. Thank you Angela for review we appreciate it. Nantucket Cottages is a quaint array of cottages close to the beach, shopping and restaurants. Perfect couple get-away! We hope you can return soon. This place was not clean. There was a damp smell, the shower wasn’t clean, there was a bottle of some sorts of liquid under the dresser, the oven had the cleaning solution sprayed in it and the sofa has dirty soil spots on it. We went and bought a blanket just to sit comfortably. We had to clean the oven so we can use it. Beautiful area. But this place was not clean!! Ashley, thank you for your review and your comments. I apologize that you did not bring this to our attention while you were here. We would have been more than happy to re-send housekeeping to clean the stove and correct any issues or relocate you. We hope you will give ResortQuest another opportunity.